Chicken Licken – he’s a little on the ‘egg’centric side…. chicken…..Lay a little egg for me! Primrose and I adore that silly ditty and were busy singing away when the phone rang and it was Barbara with news of her 4 new Henny Pennies. Very soon it will be eggs all round for their little corner of countryside when the weather warms up and the days start to get longer. (Apparently chickens tend not to lay all that much in winter). There is nothing that says living the good life more than keeping chickens! Recounting Tom and Barbara’s news, I did suggest to Jerry that perhaps the perfect moving present for us would be a pair of hens. Dear Reader, I am sure you can imagine what the response was. It turns out that apparently, I will have enough on my plate with finding a house to move to and house training a new pup without adding chickens to the mix. Jerry may have a point but I would hate to admit it…. I might just have to settle for booking myself on a henkeeping course with the lovely Sara Ward from Hen Corner who makes it her mission to spread the Good Life in the depths of urban living. She really would give Tom and Barbara a run for their money! So here’s how you do it! 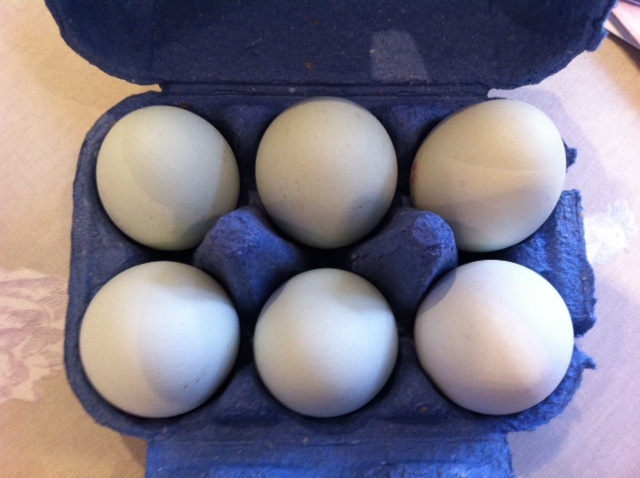 We used the most beautiful pastel shaded eggs laid by lovely feathery ladies of the Cotswold Legbars variety from Clarence Court eggs (@ClarenceCourt). They were really rather gorgeous to look at. 1. Pierce the egg with a needle and then carefully peel a tiny bit if shell away so you have a small opening. Use a chopstick or other long thin object (knitting needle, skewer etc) to burst the yolk and allow egg to drain away into a container. (Afterwards, we indulged in glorious scrambled eggs and smoked salmon with delicious discarded yolks and whites…waste not, want not)! 2. Once all the egg has drained away, wash the shell inside and out with hot water to make sure that all traces of raw egg have been banished. Leave the egg to dry ensuring that air can get into the inside so it dries thoroughly. 3. 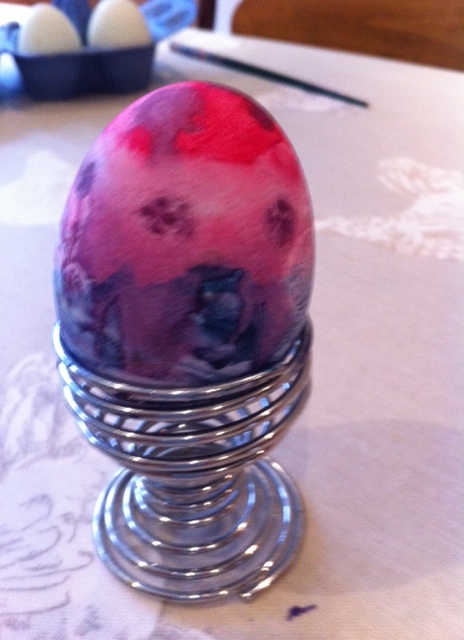 Decorate your egg once dry. Primrose and I used watercolours but you could use poster paints. Use an egg cup to keep your egg steady as you paint. (I must warn you – keep it simple and don’t get carried away with lavish designs if you are utterly useless at painting as I am. Primrose is so very arty and thoroughly admonished all my efforts. 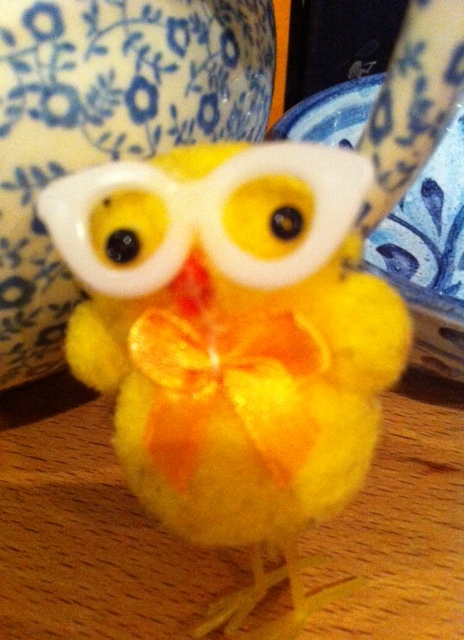 Apparently, what I thought was a reasonable attempt at a chick was more like a duck)! A dead ringer for Faberge…don’t you think, dear Reader? 5. Once the chocolate is melted, then spoon it into a piping bag. Alternatively, I use a small freezer bag (use one corner, spoon choc into the corner and snip the very end of the corner off et voilà, a homemade piping bag). Working with chocolate is a messy business and I can never be bothered to wash out piping bags! 6. Pipe the chocolate into the egg shell carefully and fill to the top. It takes a little bit of time so be patient. Finish with a blob of chocolate to seal the hole and leave to stand in the egg box in the fridge. 7. Once the chocolate has solidified, turn the eggs in the box so that the hole is on the bottom (and noone can see it!). And there you have it, REAL eggs filled with chocolate. I can promise you one thing, dear Reader, almost anyone you give these to won’t fail to be impressed and will think that you have worked slavishly on these ‘eggs’elent creations (sorry!). 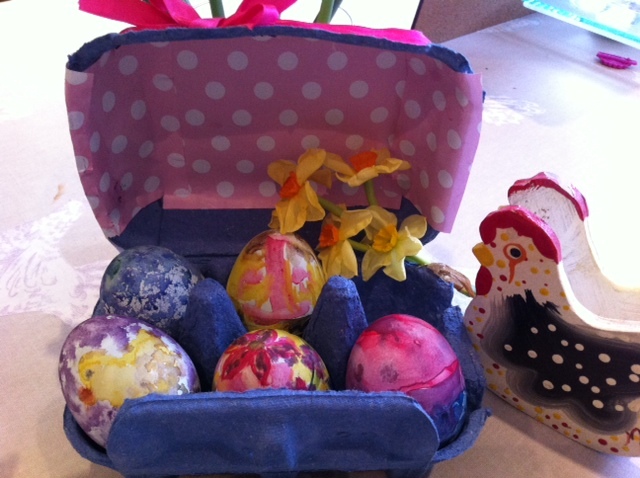 Primrose and I were pretty pleased with our efforts despite my inferior painting skills and will definitely be making some more in time for our traditional Easter egg hunt. Poppy was happy to join in too and glancing over to the kitchen table, I can tell you, dear Reader, that she is well and truly busy with one of the most important parts of the whole operation – scoffing the leftover melted chocolate from the bowl! This entry was posted in Uncategorized and tagged chickens, chocolate, Clarence Court, Cotswold Legbars, Countryside Kitchen, Easter, egg, hen, Hen Corner, hen keeping, paint, spring on March 22, 2013 by admin.